Gardens are a lovely place to enjoy birds, bees and butterflies. 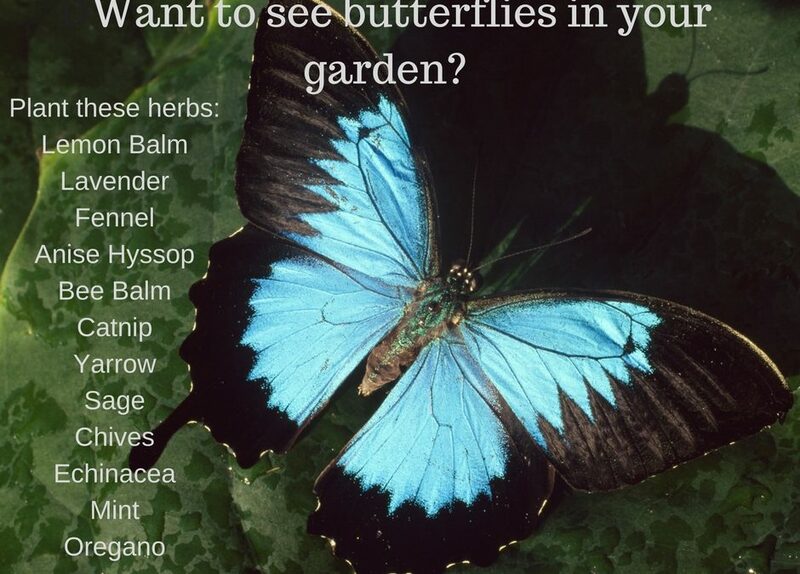 Do you want to attract more butterflies to your garden? 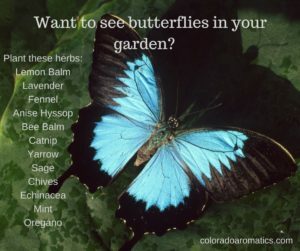 Besides being beautiful to watch, butterflies also pollinate our gardens. Butterflies eat liquids that include the juice from fruit and the nectar of flowers. You can probably attract some by leaving out pieces of cut fruit for them to dine on. Butterflies eat, or rather drink through their proboscis. Flowers that butterflies love include lemon balm, lavender, fennel, anise hyssop, bee balm, catnip and yarrow. These are all herbs that we grow on our Colorado Aromatics farm. Be sure to feed the larvae, or caterpillars too. This early stage eats only leaves and includes many vegetable plants unfortunately, but also clover, fennel, hollyhock, hops, lilac and mallow. Want a butterfly to land on you? They enjoy the salt in sweat, so exercise a little first to increase the likelihood of one landing on you. Butterflies are very active during the day looking for food. At night, they tend to sleep on the underside of leaves or in small crevices between rocks.You can also build them a house that has narrow openings where they can hide. A butterfly has 4 stages to its life cycle. The egg, caterpillar (or larva), chrysalis (or pupa) which overwinters on a plant, and the butterfly. The lifespan of a butterfly is only 2-4 weeks, so enjoy them while they are around. There are 28,000 different types of butterfly species worldwide, find out about species that are common near you. Butterflies are so beautiful. We get them on our clover every year.